It's the laaaast weeeek! A week today, that will be it. Myth of the Wild will be closed for Christmas and I can start enjoying the season like the child I am. Lots of chocolate, stupid movies, loud music and jumping. I love it. So. Much. Not that I don't enjoy running my shop over this season - it is a stress, but to be honest, I love hearing from happy customers, and I seriously love the sensation of lying down after working until 11pm every night, and especially putting the hard work behind me after my final post run. I always buy a seasonal bubble bar and bath bomb from Lush and pencil in a long and lazy soak in the bath after lunch that day. It is awesome. It's also during that week - or that Monday to Thursday - that I do all my Christmas wrapping which, as always, involves a hot chocolate and a box of chocolates with a Christmas film, all the Christmas lights on and singing rather spasmodically to make my mum laugh. Since her operation - which I have yet to mention, I think - she's been in an understandably much better mood and is finally smiling and laughing again. I'm hoping to get out to dinner with my best friend and have a games day, and perhaps play some video games myself. 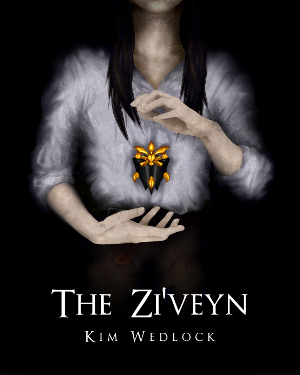 I've just got to Skellige in The Witcher, and I never did finish Mass Effect 2. 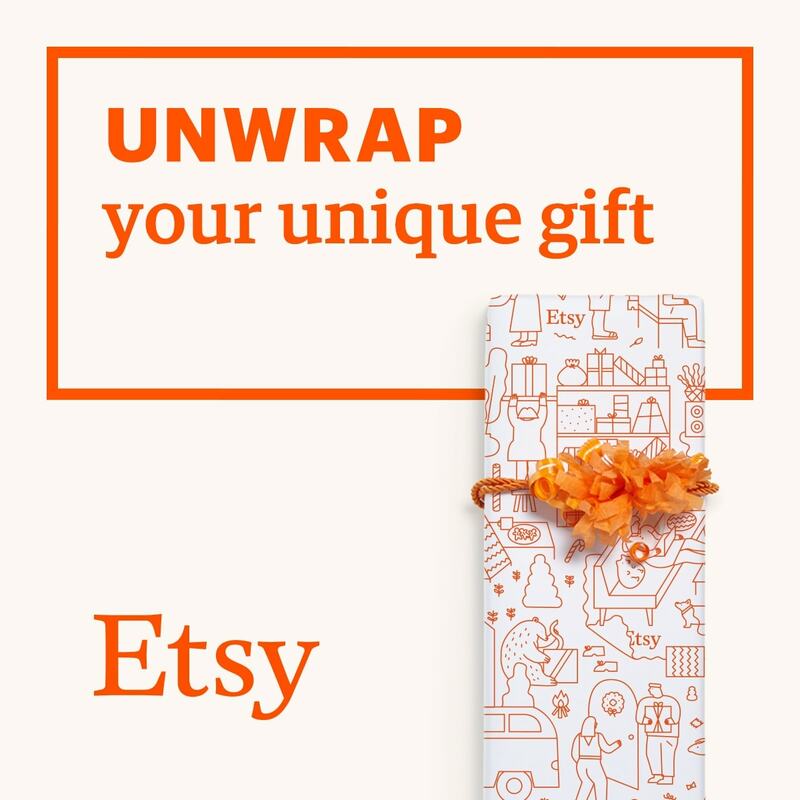 The 'ready-to-ship' section will be created on the 14th and will contain only products and stock levels that have been made ahead of time and are ready to ship, and will contain the remaining left-overs from my gallery exhibit, too, like wolves, cheetah and deer, assuming I still have any left. And a few book flowers in the most popular titles, like Harry Potter and Pride and Prejudice. 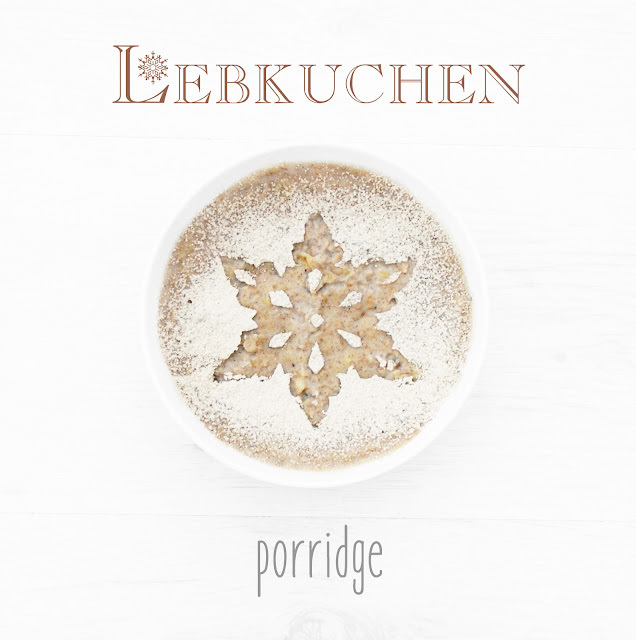 For now, though, it's breakfast time, and I bring you this year's seasonal favourite: lebkuchen porridge. A simple porridge with spice, honey which is used in almost every lebkuchen recipe, and optional fruit. Apricot is most commonly used, but pear works well too and isn't as sweet or strong, so brings out the spices a little more. I've written the recipe with skimmed milk, but, honestly, whole milk is best here because it gives such a creamy texture, and that texture combined with the gentle sweetness of the honey and the tickle of the spices makes such a luxurious bowl. Yes, porridge really can be luxurious. If you're using a pear, peel and chop it, and set it in a pan with 2 tbsp hot water and simmer for 10-15 minutes, then mash with a fork. Do not drain. If you're making overnight oats, this can be done either the night before with the oats, or it can be done the next morning while warming. It makes little difference. 1. Combine oats, whey and spice in a bowl (or shaker bottle) and, stirring all the while, add 100ml milk (or shake and transfer into a bowl). 2. Set in the fridge overnight. If you'd like it warm the next morning, add your warm mashed pear and whatever water is left into the cold porridge mix, then heat in the microwave for 1 minute, stir, then 20-30 second bursts until desired consistency is reached. Add more water if necessary. Move on to step 4 below. 2. Thoroughly combine oats, whey and spice in a pan. Then, stirring all the while, add the milk and then the boiled water, then bring to a boil over medium heat. 3. Add the warm mashed pear and its remaining water if using and reduce to a simmer on the lowest heat. Allow to thicken for 15-20 minutes, until desired consistency is reached, stirring to prevent sticking and burning. 4. Transfer to a bowl and stir in 10g honey. 5. 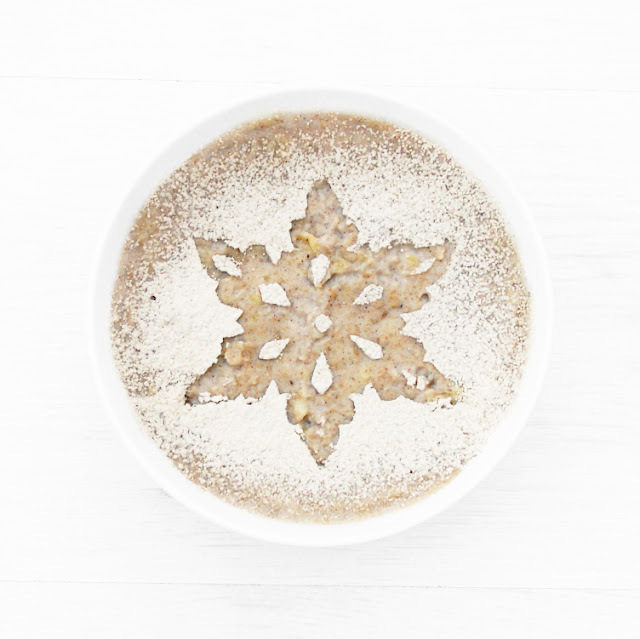 Set a snowflake stencil over the top of the porridge and sieve 5g chestnut flour over the top. Carefully remove the stencil and serve. • I made a paper stencil and cut long tabs into the straight edges on 4 sides, folded them along that line so they didn't intrude in the shape and used them to lift it away.